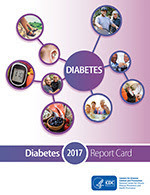 The Centers for Disease Control and Prevention's Division of Diabetes Translation has released the 2017 Diabetes Report Card. The Diabetes Report Card provides the most current information and data available about diabetes and prediabetes, along with diabetes-related preventive care practices, health outcomes, risk factors, and national and state trends. Overall rates of diagnosed diabetes seem to be stabilizing (although not in all populations). The number of organizations that deliver the National Diabetes Prevention Program and the number of adults participating in the program has increased. Members of some racial and ethnic minority groups are more likely to have diagnosed diabetes than non-Hispanic whites. Although an estimated 84.1 million US adults have prediabetes, only 11.6% of them are aware of having it. To learn more about what CDC is doing to help control complications from diabetes and prevent type 2 diabetes, please visit the Diabetes website.